About 67 percent of the returns this year have been to Syria’s Aleppo province, where the opposition-held eastern part of the city was retaken by President Bashar al-Assad’s government in December, the IOM said. And while Trump’s decision to stop a covert CIA program to funnel weapons to groups that record themselves beheading children should be praised by the media, it was instead labeled as a pro-Russian move by the mass media propagandists. In reality, much of the opposition forces fighting against the Syrian government are aligned with al-Qaeda and ISIS factions. Thus, the move to stop the flow of arms to terrorist affiliates should have been applauded as part of the larger struggle against Islamic extremism. Mhardeh in Syria's Hama lights up for Orthodox celebrations. In fact, this move by Trump was actually proposed in legislation by Congresswoman Tulsi Gabbard in the House and Senator Rand Paul in the Senate. As the Free Thought Project reported in April, the US knew al-Qaeda leader al-Zawahiri called on Muslims in Turkey and the Middle East to aid the rebels in the Free Syrian Army. From this day forward, the lines between who Al-Qaeda or the ‘rebels’ actually were — became heavily blurred. 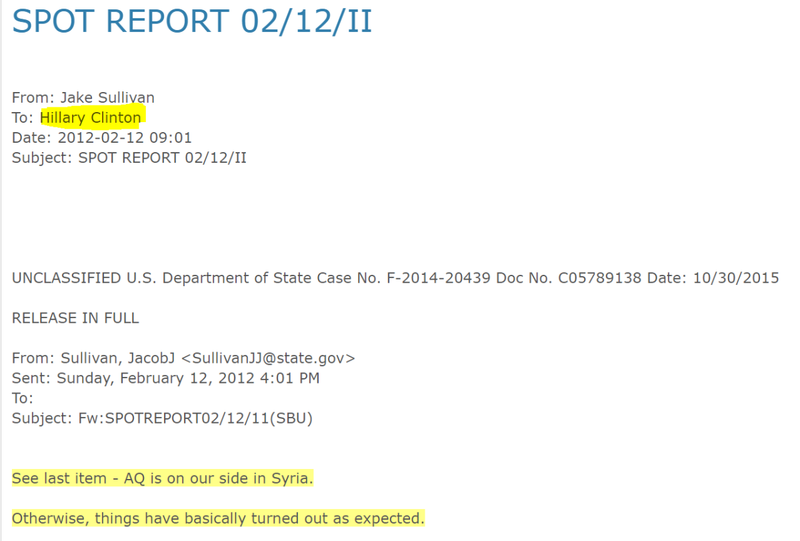 But, according to a State Department email, the United States did not care as they knew Al-Qaeda was on their side. UNCLASSIFIED U.S. Department of State Case No. F-2014-20439 Doc No. C05789138 Date: 10/30/2015 AL-ZAWAHIRI URGES MUSLIM SUPPORT FOR OPPOSITION (U) Al-Qaida leader al-Zawahiri called on Muslims in Turkey and the Middle East to aid rebel forces in their fight against supporters of Syrian President Asad in an interne video recording. Al-Zawahiri also urged the Syrian people not to rely on the AL, Turkey, or the United States for assistance. Once this wire went out to multiple departments in the form of an Ops Alert, apparently there was originally some concern about Al-Qaeda joining the ranks of the US-supported rebels — who are being used by the American Deep State to destabilize Syria on behalf of special interests. 600,000 Syrians run back to the evil brutal dictator who bombs and gasses civilians for no reason. Without question, the covert CIA program precipitated the rise of the “moderate rebel” factions that led to the massive refugee crisis seen in Syria. Syrians who remain internally displaced number at about 800,000, many of whom have fled violence and strife for the second or third time, according to the IOM. An estimated 808,661 people have been newly displaced this year, “many for the second or third time,” Headon said. The estimated 6.4 million IDPs in Syria have almost invariably, fled to Syrian government controlled areas for refuge from the US Coalition extremist factions who have driven them from their hometowns and villages across Syria. The mass of returning Syrian refugees was largely due to military losses by ISIS and al-Qaeda affiliates after Syrian government forces recently removed the terrorist forces from their last stronghold in the central province of Homs, recapturing the strategically important town of al-Sukhna after the group took hold of it in May 2015. Syria’s civil war, now in its seventh year, has devastated the country, claimed hundreds of thousands of lives and displaced about half of the pre-war population of 22 million, according to Al Jazeera. When analyzing the massive refugee crisis precipitated by the Syrian conflict, it becomes clear that U.S. moves in support of terrorists in Syria have little to do with the welfare of the Syrian people, and everything to do with a regime change operation intent on installing a US-backed puppet government.